At approximately 10:10am, Saturday May 7th Kenmore Fire Department responded to 392 Wardman to a reported kitchen fire. Upon arrival we found all occupants had evacuated and heavy smoke. Fast team was provided by Kenilworth, Ellwood provided a pumper while brighton stood standby at our hall. We would like to thank them all for their assistance. Weeks of work came to completion as our members spent Friday delivering Christmas baskets to families in the Ken-Ton area. Kenmore Fire had our 2015 Open house. We would like to thank all who attended. Kenmore Fire participated in the annual Kenmore West homecoming bonfire at Crosby field. We took part in the 1st Annual Firefighter Appreciation Rib Eating contest this afternoon at Texas Roadhouse. Our team consisted of Chief S. Whitney and FF B. Finn. 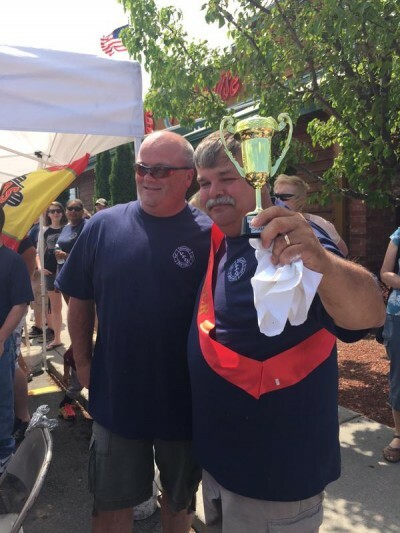 We are proud to say that FF Finn was the first to finish his enormous plate of ribs, clinching the victory for the KVFD. We had two crews out on the streets digging out Village fire hydrants again today. With more snow coming, please help us out and clear any new snow from hydrants that we cleared, and if we didn’t get to a hydrant please clear it. Having a clear hydrant allows us to focus on saving lives and property in an emergency. We started the year off with a working fire on Deumant Terrace, along with Ellwood Fire Co. See our News page for further details. Our members along with help from friends and family of the KVFD assembled and delivered 72 food and gift baskets to families in need of some assistance on Friday 12/19/14. This link is a time lapse of all of the work that goes into making the day a success. We responded to a 4 car accident at the corner of Delaware Ave. and E. Girard, with reports of one person injured and a car into a building. We examined two patients who were only shaken up with no injuries. The building however suffered structural damage. Final day at Mang Park for Kenmore Days. Come enjoy the rides, games, food and fireworks tonight. 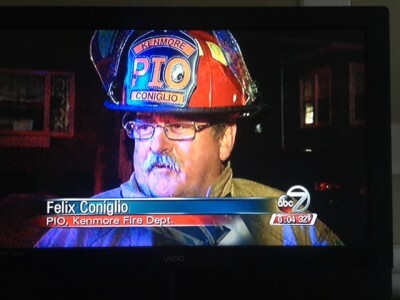 We would like to congratulate firefighter Nick Coniglio and his wife Collene on the birth of their daughter. Everyone is doing very well! We Just returned in service from a fire involving two garages. The cause of the fire is still under investigation. We were assisted by Kenilworth, Twin City Ambulance, and the Town of Tonawanda Paramedics. The KVFD took on Ellwood Fire Dept. 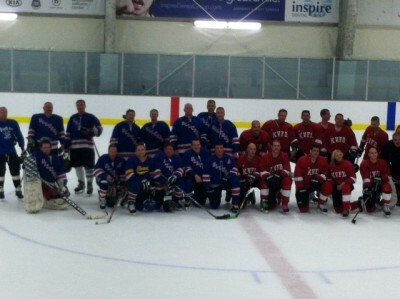 today in an ice hockey game at the Northtown Center. Through strong team play, we were able to beat Ellwood by a score of 8-5. Both sides had a good time and look forward to future games together. A heartfelt thank you to the members of Kenilworth, Brightion, River Road, Ellwood and the Town of Tonawanda Paramedics for coming out and paying their respects to 59 year active member Robert “Papa Moe” Moreland. I know that it meant a lot to the family, as it was a really impressive turnout. It also meant a lot to the men and women of the KVFD to see the love and brotherhood in the Town of Tonawanda. 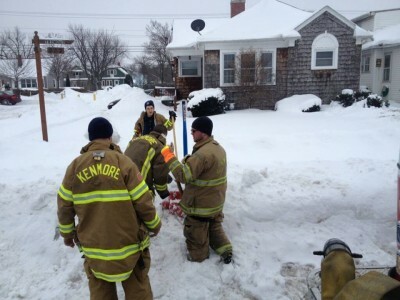 Kenmore fire responded to 31 Harding Ave. for a report of a structure fire, at 0844 hrs this morning. Kenmore Engine 1 went on location with heavy smoke from the rear of the structure. Kenmore 9-1 reported a working fire in the rear of the structure with possible extension into the house. Kenilworth responded as the F.A.S.T. Fire was knocked down at 0853 hrs. It is with a heavy heart that we announce the passing of Past President Robert “Papa Moe” Moreland. Moe passed away early this morning surrounded by family. 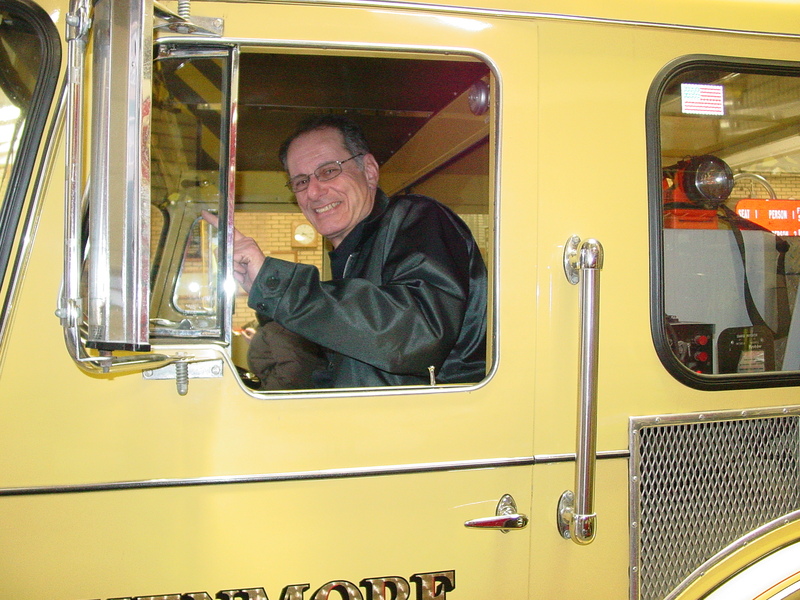 Moe joined the KVFD in December of 1954, and has served the residents of the Village of Kenmore for the past 59 years. He served as President of the Dept. from 1984-1986. Moe served as the Parade Marshal for as long as any of us can remember, leading our department to enjoy success in many parade marching competitions. 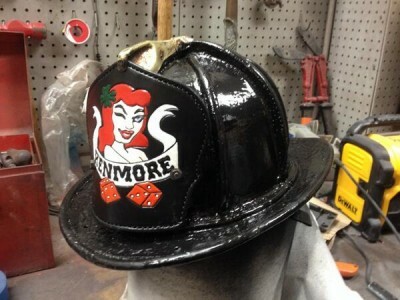 The Morelands have a proud tradition of service to the Kenmore Fire Dept. Willard Moreland, Papa Moe’s brother, was the first member to be honored with 50 years of service, and his son Robert “Skip” Moreland is still a very active member with more than 25 years of service. The family will be present to receive guests on Tuesday 5/27 from 3-8 pm at Wedekindt Funeral Home 3290 Delaware Ave. Kenmore, NY 14217. All Fire Dept. personnel are requested at 7pm. Prayer Service will be held on Wednesday 5/28 at 9:30 am at Wedekindt Funeral Home 3290 Delaware Ave. Kenmore, NY 14217, followed by a procession to the Kenmore Fire Dept. It was our monthly meeting night, and we were toned out for a fire in an occupied structure, with reports that they were getting the children out of the house. Upon arrival, we found a basement fire and the house charged with thick black smoke. Our crews made a quick and aggressive attack, and put the fire out quickly, and then moved on to ventilating the smoke from the home. Minimal damage was done to the home. The majority of the damage was smoke related. The fire remains under investigation. We were assisted on scene by Kenilworth (F.A.S.T.) Town of Tonawanda Paramedics, and Twin City Ambulance. The Kenmore Fire Department held their annual elections of officers this evening. Congratulations to all of the newly elected officers! 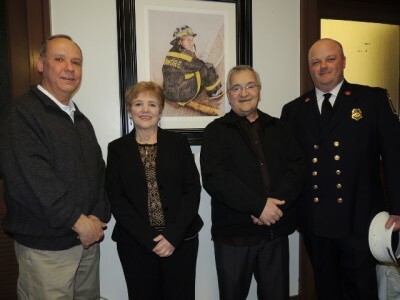 A new painting was unveiled today at the Municipal Building in honor of fallen Kenmore firefighter Timothy Goff, who lost his life due to injuries sustained in the 1997 Caton-Hendler Paint fire. Chief Kiefer has led the department for the last four years. He will continue to share his knowledge and experience with the membership. We responded to an alarm of fire on Nassau tonight to find smoke and fire, coming from the second floor, and extending into the attic. The fire was very quickly knocked down. Extensive overhaul was needed. The cause of the fire remains under investigation. 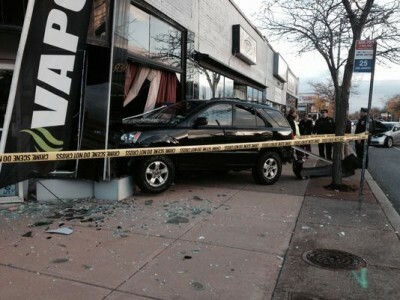 All of the residents were able to get out of the building and no injuries were reported. We were assisted on scene by Kenilworth who responded as the F.A.S.T. team. Don’t forget to put your clocks forward an hour & change the batteries in your smoke and carbon monoxide detectors tonight. We would like to congratulate our President Dave Catalano and his wife Meghan on the birth of their son. Everyone is doing very well! We have had a busy start to the weekend. 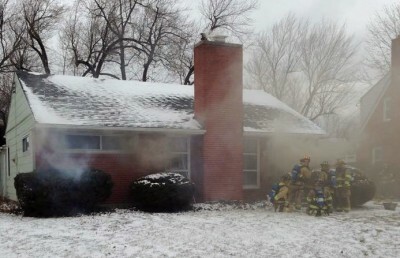 We were called yesterday to fill in at Grand Island’s station #1 while they had a working fire during the day. Then we were called in as mutual aid last night to a warehouse fire on Woodward Ave by Sheridan Park, where we were put to work . This afternoon we answered a call for a burst water line on the 2nd floor of a home on Woodward Ave., and we just returned, in service, from a working fire on Nassau Ave. We encountered a kitchen fire with extension to the 2nd floor. The fire appears to have been started by electrical, but is still under investigation. The very cold temperature made for a very slippery scene. We were assisted on scene by Ellwood, Kenilworth (FAST) and Brighton (Stand-by). With all of the recent snow, we remind you to please shovel out fire hydrants if they are in front of your home. It will save us valuable time and potentially lives in an emergency. Halloween parade from Wardman Rd. and Delaware Rd. starts at 6pm. tomorrow, followed by the annual community party at the fire hall. Have a safe and Happy Halloween. Winter Parking Ban goes into effect at 2 am on 11/1/13. Please remember to have all vehicles off of the street tomorrow night. We would like to congratulate our Vice President EJ Tsakiris and his wife Carrie on the birth of their son. Everyone is doing very well! The Kenmore Fire Department was called to a working fire in the Kenilworth District late Sunday afternoon, as a F.A.S.T. Shortly after arrival we were put to work for fire suppression and eventually overhaul. Our Ladder truck was put up for the master stream. We will be at Dog Days of Kenmore today from 12-4, showing off our pet oxygen masks. Come bring your 4 legged friend out for a good time! Congratulations to the firefighters that competed in the Hero Rush today. We had 5 firefighters representing the Kenmore Fire Dept. The KVFD just returned from a garage fire on Thurston Avenue. We were assisted by Ellwood Fire company, and Kenilworth Fire Company as FAST. We encountered a garage that was packed full, making the fire more difficult to extinguish. The Kenmore Volunteer Fire Dept. will hold it’s annual Installation Ceremony this evening for the newly elected officers. Congratulations to all of the officers. In light of yesterday’s tragedy in Boston, we would like to pass along information provided by the Town of Tonawanda Police Dept. The Kenmore Volunteer Fire Dept. held their annual election of officers this evening. Congratulations to our newly elected officers! A message from the Kenmore Police Department: As of midnight tonight, the winter parking ban is no longer in effect until November 1st. You may park on the street starting this evening. Remember to set your clocks ahead an hour tonight, and take a couple of minutes to check your smoke detectors and replace batteries as needed. The KVFD would like to congratulate William Drenko on his installation as President of the Allied Fire Commissioners. It is with a heavy heart we announce the passing of active fire fighter Franklin Kimmins. 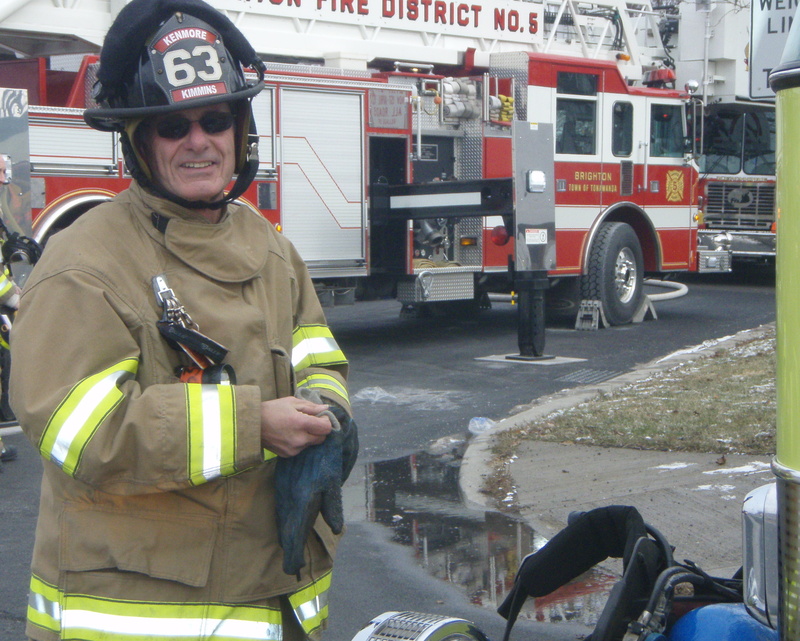 Frank had over 30 years of active service with the KVFD and will truly be missed. We are also sadden to announce the passing of Jean Whitney (Shannon Whitney’s mother) this morning. Our deepest thought and prayers go out the Kimmins and Whitney families. Friday February 8th: Funeral Service at St. Christopher’s R.C. Church (2660 Niagara Falls Blvd) at 9:30am. The family requests that all firefighters attending to please wear their full dress uniform. Saturday February 9th: Memorial Mass at St. Pauls R.C. Church (33 Victoria Blvd) at 9:15am. Please see WIVB news story on our News tab concerning tips for battling the bitter cold temperatures that we are facing. Kenmore President and Past Chief Felix Coniglio is featured in the video. 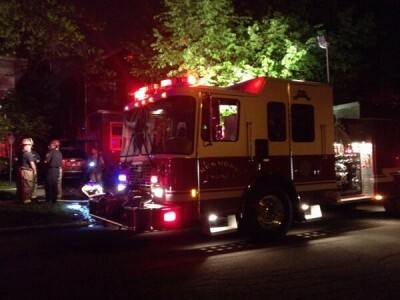 The KVFD responded early this morning at 0059 Hrs for a report of a bedroom fire on Keller Ave. Kenmore 9-2 went on location with smoke showing and requested a FAST Team to the scene. Command reported heavy fire & smoke on from the side of the two story dwelling and requested two additional engines to the scene. Sheridan Park, Ellwood, & Kenilworth (FAST) responded mutual aid to the scene. Brighton filled in at Kenmore’s hall. The fire was under control in 40 minutes. Two residents were treated at the scene for smoke inhalation. 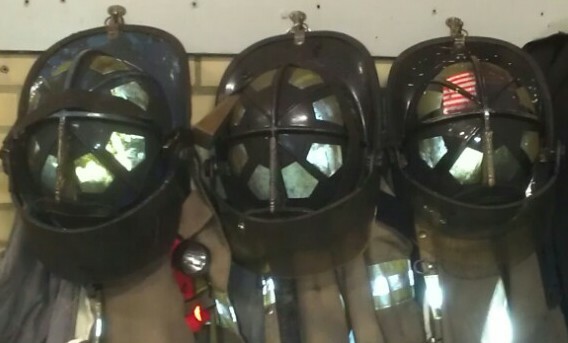 One Firefighter suffered a facial laceration requiring stitches. Who says our EMS crew doesn’t get dirty? The KVFD responded to a structure fire tonight on Nassau Ave. The first arriving apparatus reported a working fire on the 2nd floor. Initial reports stated that there was a possible child home alone. It was later confirmed that the child was not home. A dog was brought out of the apartment, and CPR was administered, but the dog was not able to be saved. The fire took 30 minutes to bring under control. There was fire and heavy smoke damage to the 2nd floor and water damage to the first. Total damage is estimated at $125,000. The KVFD was assisted by Kenilworth as a FAST team and Ellwood provided stand-by at our fire hall. The Ellwood Chief happened to be around the corner when the call was dispatched and provided assistance at the scene, having command until Kenmore Chiefs arrived on Scene. The KVFD responded to a report of a motor vehicle accident involving two school buses on Military Rd. this morning. Upon arrival it was further reported that one of the buses had then crashed into a building on Miltary Rd.. All of the students were evaluated by medical personnel. One of the bus drivers was issues a citation. CLICK HERE for the WGRZ story. The men and women of the Kenmore Volunteer Fire Dept. would like to wish everyone a safe and happy New Year! Our thoughts and prayers are with the family, friends, and fellow firefighters of West Webster FD Past Chief Mike Chiapperini and Firefighter Tomasz Kaczowka. 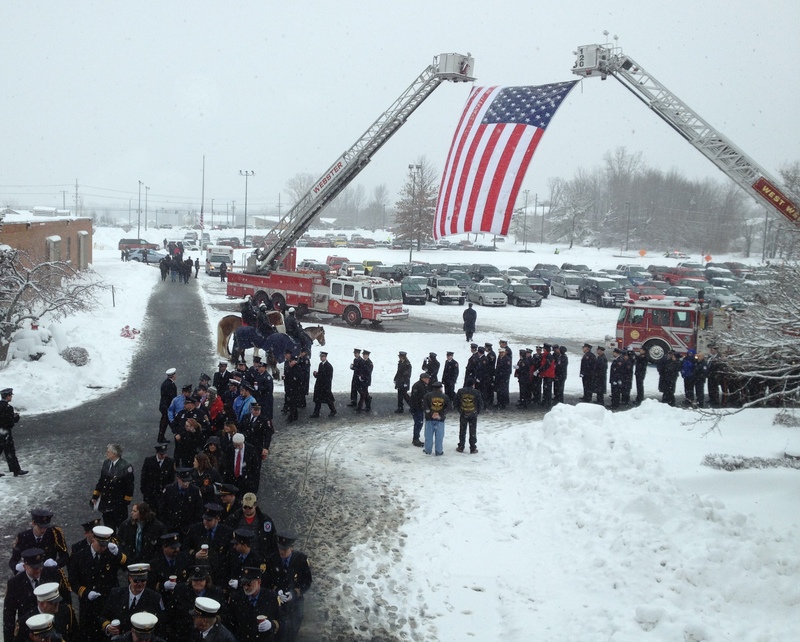 Today’s memorial service showed the true meaning of brotherhood in the fire service. We are honored that we could take part in paying our respect today. 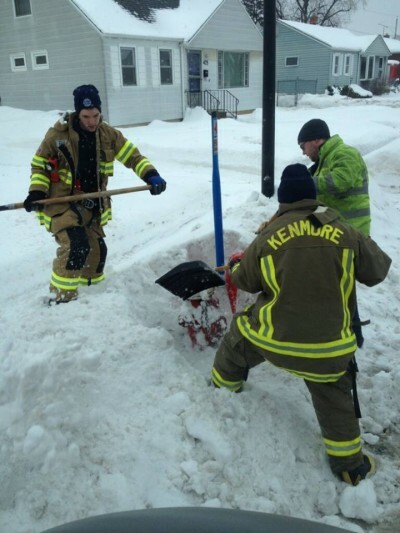 The KVFD reminds all residents and businesses in the Village to please shovel out fire hydrants, allowing us faster and easier access to them in an emergency. Merry Christmas from the men and women of the KVFD!!! Thoughts and prayers go out the the people of Webster, NY that have been effected by the tragedy this morning. A gunman opened fire on firefighters, responding to a house fire, killing at least two firefighters and injuring others. The fire continues to burn because the scene is not safe for responders. Attention all members: Pre-sale tickets for our annual chicken BBQ are in, Please contact Jeff Koch for your tickets. All members are required to sell tickets. Kenmore Firefighters responded this evening at 1730 Hrs for a report of a rollover MVA on Delaware Ave.
Kenmore 9-2 went on location reporting 1 victim trapped and requested Sheridan Park to the scene for extrication. Sheridan Park 9 reported no injuries and crews removing the roof. The victim was extricated in 31 minutes. All members participating in the Crosby Field Bonfire should report to the hall at 1800 hours. The KVFD reminds you to set your clocks back an hour before you go to bed tonight. Remember to replace the batteries in your smoke and carbon monoxide detectors too! The KVFD would like to share a message from the Town of Tonawanda Paramedics: Just a reminder!! In the event that you lose power, please run your generators in a well ventilated area. Make sure the exhaust is blowing away from you house and that you have a functioning CO detector!! Thank you and be safe! Check on your elderly and disabled neighbors. The men and women of the KVFD were very saddened to hear of Father Joe Moreno’s passing earlier today. Just like all of the stories are reporting, Father Joe was always there whenever needed. He has assisted our department through some very difficult situations, and for that we will always be grateful. Rest in peace, Father Joe. President Coniglio asks that any member with extra pagers/bases return them to the hall. New air packs have been placed in service on Engine 1 and Ladder 6. The men and women of the KVFD would like to take a moment to remember all of the victims from the attacks 11 years ago, including 343 members of the FDNY. 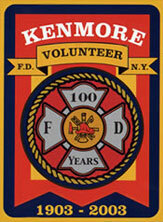 The Kenmore Volunteer Fire Dept. responded as part of a District 1 Class 1 alarm of fire to FMC on Sawyer Ave. A machine full of Ammonium persulfate was found to be on fire. A Haz-Mat crew from Brighton was called in, along with a 2nd alarm for additional manpower. 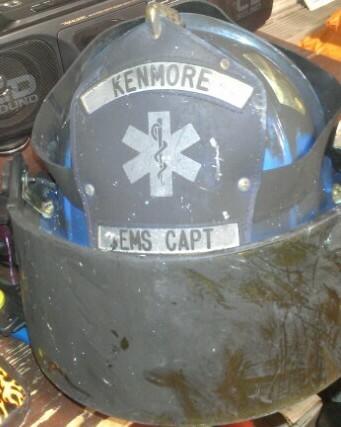 A Kenmore firefighter suffered a chemical steam burn to his wrist. He was transported to ECMC where he was treated and released. Today is the first day of school for the Ken-Ton district. Please be careful and watch for kids and school buses. The members of the KVFD were called this afternoon, to the grass fire that doesn’t seem to ever end. Mutual aid consisted of most of Erie county including a truck from as far away as Newstead. All members: Please check the running order board. There is a new “Mutual Aid” assignment. Thanks to the Amherst High Angle Rescue Team for their assistance at the Village water tower this morning. The Kenmore Volunteer Fire Dept. would like to take a moment to remember Buffalo Firefighters, Lt. Chip McCarthy and Firefighter Johathan Croom, who answered their final call 3 years ago. Pictures from Tuesday’s District One Brush Fire are now up on the site. Click Here to view. Did you get your copy of the KVFD August Newsletter in your inbox? Any active or associate member wishing to get the news letter along with any special messages electronically, please send a request to info@kenmorefire.com to be added to the distribution list. Thanks! The KVFD will be parading in Bowmansville today for the Bowmansville Volunteer Fire Association Centannial. Please come out to the parade and field days. Look what we just found! A 1985 commercial filmed at the Kenmore Volunteer Fire Department, and featuring the men and women of the KVFD. CLICK HERE: To watch the commercial. 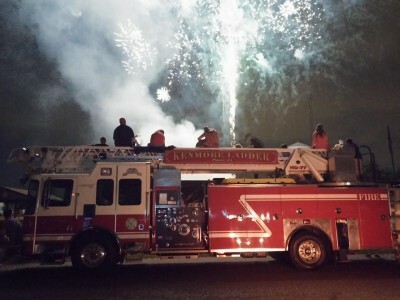 Come out and see the KVFD tomorrow night at Kenmore’s National Night Out. The event is being held at Kenmore Middle School, in conjunction with the kid’s concert series, starting at 6:15. There will be a special drill tonight at the fire tower, the trucks will leave at 1900 hrs. 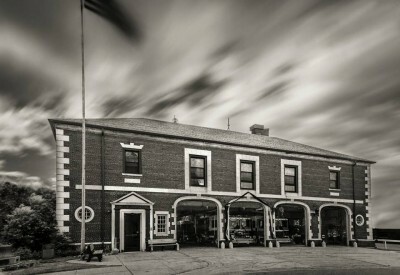 The Kenmore Fire Dept. responded early this morning for a report of a vehicle into an occupied home. Upon arrival KVFD found a SUV partially into a residence. The vehicle had sheared off the gas meter in the basement, and the house was filling with natural gas. The resident, who was asleep in her bed against the wall that was hit, was evaluated at the scene and was not transported to the hospital. Utility companies also responded and were able to have the gas, electric and water shut off. The resident’s cat was found uninjured, and returned to the home owner. 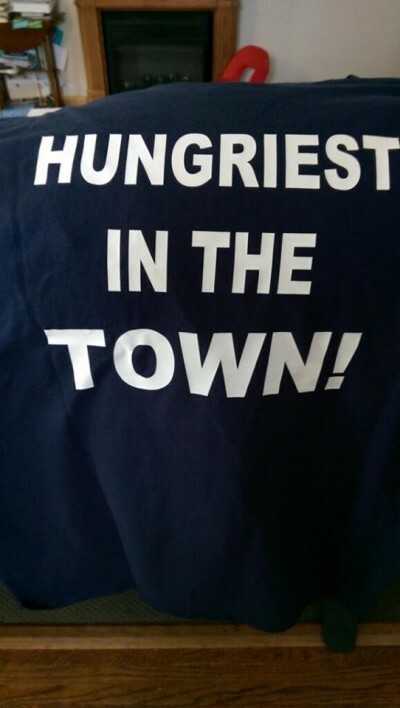 CLICK HERE for pictures. CLICK HERE for the WKBW Channel 7 story. Governor Andrew M. Cuomo today urged all New Yorkers to take extra caution, as dry weather conditions have led to a heightened danger of wildfires across Upstate and Western New York. In addition, the state today will institute a statewide residential burn ban for 90 days through October 10. For the complete info on this, please CLICK HERE. 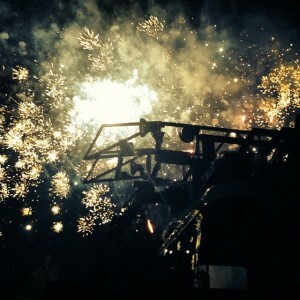 Kenmore Days came to a close with a fantastic fireworks show. Thanks to all of the members that donated their time for the EMS and Fire stand-bys at the park over the last 4 days. Kenmore Days kicked off with a Caribbean concert on the Village Green. We have a link of all the Kenmore Days activities on our Links page. It looks to be the start of another very busy summer for the Kenmore Volunteer Fire Department, as the department had it’s 6th working fire of the spring tonight. Please view our news page for stories and audio of the recent fires, along with pictures on our Photos page. 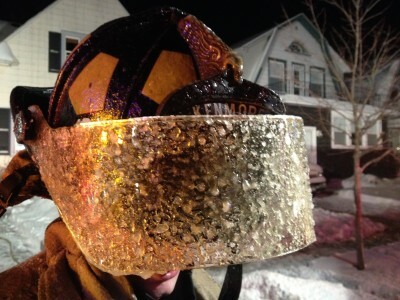 The Kenmore Volunteer Fire Department had a very busy evening Friday night, into Saturday morning. The men and woman of the Kenmore Volunteer Fire Department had just completed their weekly drill at the Town of Tonawanda fire tower. Shortly after returning to the fire hall, an alarm of fire was dispatched on Tulane Rd. The Chief reported a 2 1/2 story, two family dwelling with heavy fire from the 2nd floor. He further reported that the fire was on the 2nd story exterior porch of the building. The fire was quickly extinguished with limited damage to the interior of the structure. Shortly after returning to the fire hall and getting all apparatus back in service, a District 1 Class 1 fire was dispatched to an industrial facility on Sawyer Ave. A Sheridan Park Assistant Chief reported a fire in the middle of the plant. Kenmore’s crew stretched a 2 1/2 inch line approximately 1000 feet into the plant where they were able to extinguish a fire in a large industrial machine.